Is designed to significantly improve store profitability by preventing cashier-caused shrink associated with theft, fraud and errors. Weeds-out poor or suspect performers, and teach managers to run measurably smarter and more efficient check-out operations. 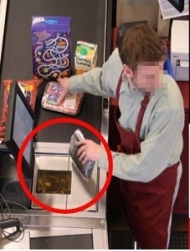 Is the only preemptive loss-prevention solution that is guaranteed to prevent cashier related shrink — before it happens. Uses intelligent data mining technology analyzes data points throughout the store. Provides exclusive narrative action plans provide store managers with intuitive analysis of their most shrink-sensitive areas and employee productivity opportunities, as well as suggestions for corrective action, all in easily understood plain-English text. Targets specific transactions for fraud, deception and inefficiency, while identifying cashiers whose patterns and trends suggest suspicious or problematic behavior. ShrinkTrax is able to automatically learn each store’s unique statistical characteristics then monitors daily, weekly, 6- and 12-week trends by cashier, store or groupings of stores. But the sophistication doesn’t stop there: rather than reams of unfathomable tables, ShrinkTrax instead arms and guides store managers with actionable information, using plain-English descriptions of shrink-related activity that’s graphical, simple to comprehend and quick to act upon. Problem areas are pointed out, complete with the best-practice corrective action to eliminate shrink and other store inefficiencies. Further, managers are able to drill-down to item level, provide enterprise summaries, and use lane accountability for till reconciliation. The net result is ShrinkTrax reduces shrink in a store by 10-38%, improves cashier productivity and accuracy 7-11% and increases store profits in just 12-16 weeks.